A fresh assault on Ireland's corporation tax regime is coming. France and Germany are working on plans to harmonise corporate tax rates across the eurozone. 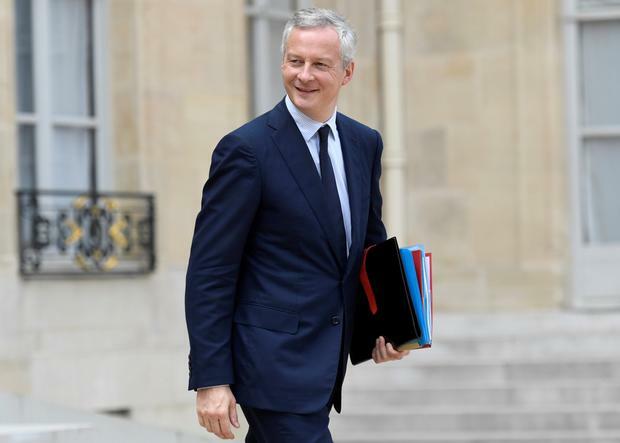 French Finance Minister Bruno Le Maire told Bloomberg on Friday that President Emmanuel Macron's plans to lower France's rate to 25pc by the end of his term should be seen as the start of a push for better alignment of eurozone countries' tax systems. France is making "a considerable effort", Mr Le Maire said. "We're asking other member states of the eurozone to make a similar effort in the other direction. "The objective is a common corporate tax with Germany in 2018 which should be the basis for a harmonisation at the level of the 19 member states of the eurozone." The renewed drive for harmonisation comes as Paris and Berlin seek to clamp down on tech companies' tax avoidance schemes. A German finance ministry spokesman said yesterday that the two countries discussed tax issues last month and Germany is set to discuss specific proposals after its election in September. Mr Le Maire said France would present its plans for "real taxation" at a meeting of officials next month. He thinks that current European efforts on corporation tax reform are taking too long. "Europe must learn to defend its economic interest much more firmly - China does it, the US does it," Mr Le Maire said. "You cannot take the benefit of doing business in France or in Europe without paying the taxes that other companies - French or European companies - are paying." The move puts Irish officials in a tricky position. The 12.5pc tax rate is an important pillar of our economic model which is heavily reliant on foreign direct investment. In a country where sovereignty is supposedly so important - witness the 1916 centenary bash last year - politicians have been quick to don the green jersey when moves towards tax harmonisation occur. But the tax regime has caused our country's reputation to take a bit of a battering in recent times on foot of the European Commission's ruling that Apple was given €13bn of illegal State aid, via sweetheart tax deals. With a key ally on its way out of the European Union, resisting efforts towards further integration become that bit harder. New strategies have to be formed when it comes to advancing Ireland's interests within the bloc, and relationships with those countries that remain take on an added importance. Does Ireland ally itself with the other small nations of the European Union, with which it has fewer historical and economic links? Or does it ally itself with Northern European countries, where relationships are stronger but Ireland is dwarfed in size by near neighbours? If the latter course is chosen, pressure from France and Germany may prove difficult to resist. Relationships with those countries would take on an added importance, and therefore using the power of veto risks antagonising them in a way that might cause damage to Ireland. But Ireland is not resisting every change to the global tax regime. The country is participating in a process (known as Beps) being run by the Organisation for Economic Co-operation and Development (OECD), which aims to set up a co-ordinated approach whereby companies are no longer able to minimise their tax bills via mismatches in national tax rules. Asked about the plans for Franco-German co-ordination, a Government spokesman told the Irish Independent that it sees Beps as "the standard approach for dealing with international tax reform". That sounds like a polite way of saying we won't be taking part in France and Germany's new scheme. But it looks like change of some sort may come. At EU level, Ireland has been resisting plans for a common consolidated corporate tax base (CCCTB), which would introduce a harmonised way of calculating companies' taxable profits. Michael Noonan was a strong opponent of that scheme, saying it would make Ireland's base more narrow and therefore risk the country's revenue, but now that he is departed from the scene, it falls to Paschal Donohoe to pick up the fight. But does he have the stomach? "At EU level, we have been engaging constructively with the relaunched CCCTB but...our initial view is that the proposal for a CCCTB would narrow our base. We will continue to explore ways to keep the Irish system attractive, in a way that meets new international standards," the Government spokesman told this newspaper yesterday. With its talk of "initial" positions and meeting new international standards, this statement does not smack of a Government planning to defend Ireland's tax regime to the death.